The Bulldogs won the opening draw and got the puck into the Nanaimo zone, but seconds later it was in the back of their net as Aiden Hansen-Bukata kept the puck in at the right point and simply threw on goal where it was deflected from the top of the crease by Thomas Samuelsen high short-side over the glove of Cole Demers to make it 1-0 Clippers at 23 seconds of the first. The Bulldogs didn't let the early hole faze them, as they pushed right back with a couple chances of their own, one which appeared to have gone in on a Ryan Moon rebound in the paint four minutes in but the Referee well positioned back of the net waved it off as it stayed a one-goal Nanaimo lead. The Bulldogs earned a power play a minute later, and looked dangerous on it and came painfully close to tying it as Mitchel Deelstra beat Jordan Naylor but hit the post as it stayed out. 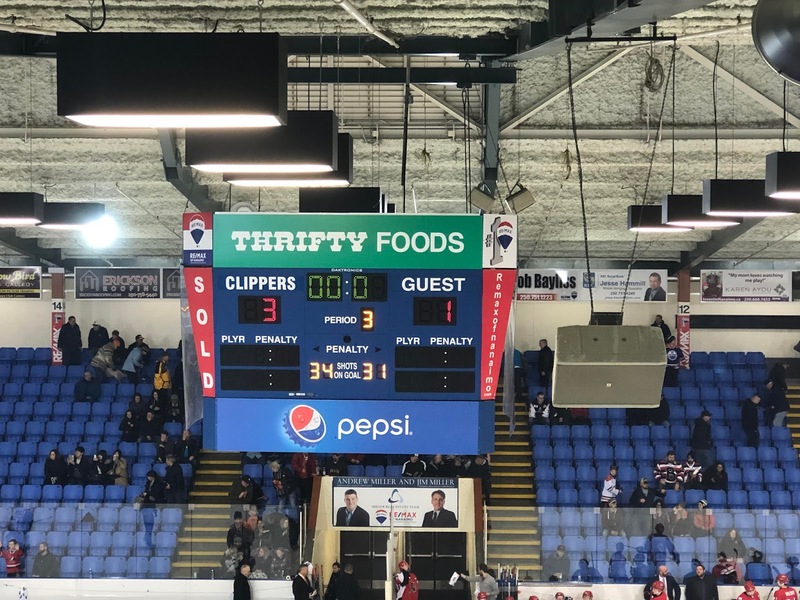 The Clippers would respond with a long attacking zone shift a couple of minutes later, peppering Demers while the Bulldogs ran around but being unable to pad their lead. The Bulldogs again responded with a couple of fantastic chances, finally drawing even with under four minutes to play as Jackson Doucet gained the red line and put a high, soft flip into the right corner of the Clipper's zone. Ryan Miotto would hustle onto it, and knock a Clipper off of it before putting a pass out front to Ryan Novecosky. His one-timer would be stopped by Naylor, but Miotto found the rebound and fired it off a defender and in to make it a 1-1 game at 16:29 of the first. The Bulldogs got right back on the attack, but couldn't convert on a couple of opportunities around the paint. They would get caught pressing a minute later, resulting in an odd-man rush that saw Cole Demers make a diving cross-ice save on Josh Bourne to keep it tied. A penalty was called on the play, and the Clippers made quick work on the advantage as Tyler Williams put a high shot on goal from the left point that was deflected from the top of the crease by Marcus Mitchell high past the blocker of Demers to make it 2-1 Clippers at 18:20 of the first, with Josh Bourne also assisting. The Bulldogs again attacked immediately, with several chances failing to find the net, before again being penalized with 23 seconds left in the period. Shots were 15-14 Clippers after 20 minutes. The Bulldogs successfully killed off the Nanaimo power play to open the second, with Demers making one great save on a pass out of the corner resulting in a one-time bid in front for Marcus Mitchell that he got his right pad on to keep it out. The Bulldogs would again push back and drew a power play that saw them threaten with over a minute and a half of attack time off the opening draw, but they couldn't cash in on it to tie the game. 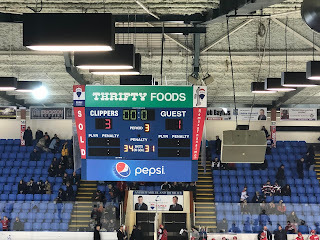 The Clippers then earned another fantastic chance on the rush, as Mackenzie Merriman knocked the puck down in mid-air and got by a Bulldog defender and in alone on Demers, who came up big to keep it 2-1. The Bulldogs were penalized late in the period but generated the best scoring chance on it as Stephen Castagna picked off a misplayed puck at the Bulldog line to race in on a shorthanded breakaway where he again beat Naylor, but hit the post short-side and it somehow stayed out while crossing the goal line and hitting Naylor before bouncing ahead to the top of the crease as it remained a 2-1 Nanaimo lead into period three. Shots in the period were 13-7 Clippers, for a 28-21 advantage after 40 minutes. The Bulldogs were penalized immediately to open the third period, but again came up with a solid kill to keep it a one-goal game They would push back and generate a couple great chances, with Naylor coming up big on a Jackson Doucet one-timer from the slot. The Clippers would have the better of the chances through to the middle of the period, with Cole Demers coming up with no less than five saves on glorious chances for Tyler Williams alone in front, Kyler Kovich on a cross-ice one-timer on a 2 on 1 rush, and finally on Sammy Steele on a long 2 on 1 with his glove to again keep the Bulldogs in it. The Bulldogs would press into the back half of the third, but couldn't find the equalizer before getting caught at the attacking line as Sammy Steele blocked a shot at the Clipper line and chased down the loose puck for an odd-man rush over the Bulldog line up the right wing where he walked in deep before snapping a quick release long side low inside the post to make it a 3-1 game, with Tyler Williams drawing the assist at 13:26 of the third. The Bulldogs would push into the final minute with their goalie out for the extra attacker and created a couple of good looks, but couldn't get one to go as the Clippers made the lead stand. Third period shots were 10-6 Bulldogs, for a 34-31 total in favour of the Clippers. Jordan Naylor picked up the win in net, while Cole Demers took the loss. The Bulldogs went 0 for 2 on the power play, while the Clippers went 1 for 4. The Bulldogs are next in action Saturday when they host the Victoria Grizzlies.